What Exactly Is sodium bicarbonate? Most of us keep a box of baking soda (sodium bicarbonate) around the house. It makes baked goods rise, eliminates acid-induced odors in refrigerators, carpets, and litter boxes and is a minimally abrasive “green” cleaning agent that can be used to scrub everything from sinks and dishes to fruits and vegetable. The Clay Cure Co. is offering for a limited period, 1 kg of Natural Sodium Bicarbonate for £4.95+pp instead of £8.95 until the 30th of April . 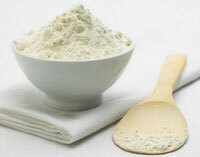 The kitchen is the most likely place to find sodium bicarbonate. Don't stop with using it for baking, though! 1. A box or small bowl of sodium bicarbonate in the refrigerator, freezer, or any cupboard will keep away unpleasant odors. 2. Similarly, sodium bicarbonate will keep away garbage odors; sprinkle the bottom of the pail, and then sprinkle again after you put a new bag in. 3. Grease fires can be put out by sprinkling them with sodium bicarbonate. 4. To clean surfaces, sprinkle sodium bicarbonate on a damp cloth. Wipe, then rinse with clean water. 5. To remove stale smells from food containers, rinse out with hot water and sodium bicarbonate. If the smell persists, let the container soak overnight in the sodium bicarbonate and water mixture. 6. To clean silver, use a paste of 3 parts sodium bicarbonate to one part water. Rub the paste onto each item, then rinse with warm water and dry with a soft cloth. 7. To remove scuff marks or grease spills from the floor, sprinkle with sodium bicarbonate and then wipe with a warm, damp cloth. This is even safe for no-wax floors! 8. For burnt-on food in the bottom of pots, sprinkle with sodium bicarbonate, then add hot water. Let soak overnight; the dried on food will come loose much more easily. Mix 4 teaspoons ofsodium bicarbonate and 1 gallon of water. Use on roses for black spot fungus and also on grapes and vines when fruit first begins to appear. Mix in 1 gallon of water, 4 teaspoons sodium bicarbonate, 1 teaspoon biodegradable soap. Mix well, spray infected foliage or soil as needed. Simply wet the crabgrass, pour a heavy dusting of baking soda on the weed. The crabgrass should start dying back in 2 or 3 days. CAUTION: When applying baking try NOT to get it on your grass as too much sodium bicarbonate can burn and kill it. After a day in the garden and dirt, clean your hands by rubbing and scrubbing wet hands with sodium bicarbonate. Rinse.